US pop diva Beyonce is so impressed with the example Michelle Obama has set as First Lady that she picked up a pen and poured out her praise on paper. The superstar songbird and new mom posted the emotional letter to the First Lady on her revamped web site Thursday, calling Mrs. Obama "the ULTIMATE example of a truly strong African-American woman." "I am proud," she wrote, underlining the word ‘proud' twice, "to have my daughter grow up in a world where she has people like you to look up to." Beyoncé and rapper husband Jay-Z have a three-month-old daughter named Blue Ivy Carter. 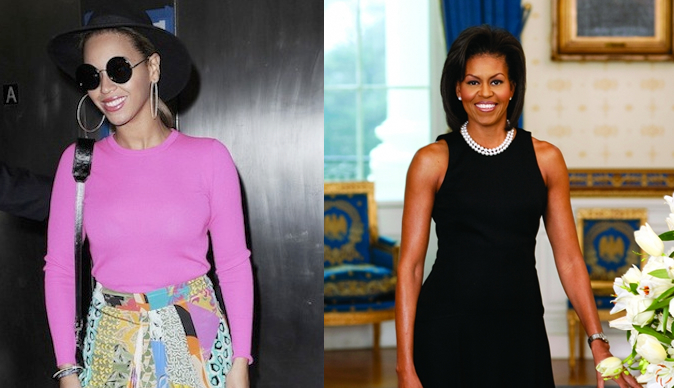 In her letter, Beyoncé called Obama a "caring mother" and a "loving wife." She lauded the First Lady for being "humble, loving and sincere" despite the "stress of being under the microscope." "She builds and nurtures her family, while also looking out for so many millions in so many ways," she wrote. Beyoncé's note, posted on Beyonce.com, gave no hint why she suddenly chose to acknowledge the First Lady's graces. But it appeared on the same day President Obama was quoted in an Atlantic Magazine article as saying he preferred Jay-Z to rapper Kanye West. "Although, I like Kanye, he's a Chicago guy. Smart. He's very talented," the President added. He had memorably called West a "jackass" for rudely rushing on stage at the 2009 MTV Video Music Awards while Taylor Swift was accepting the Best Female Video award. Asked again about that crack, the President stood by his frank assessment. "He is a jackass," he said. "But he's talented."